Destroys rust hiding inside chassis, so it won't rust thru. Internal Frame Coating destroys rust hiding inside the chassis, so it doesn't rust its way through. You spend time and money restoring a chassis, but what about all that rust inside the frame? 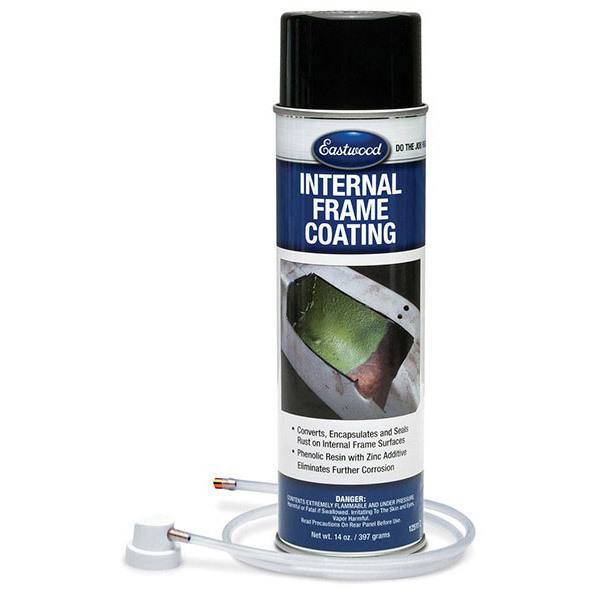 Apply our Internal Frame Coating to make your chassis rust free throughout! Tough phenolic resins penetrate, convert and encapsulates the rust on the internal surface. Zinc phosphate seals it to prevent future corrosion. Vehicle approximate application coverage requirements. (1) 14 ounce Aerosol covers 10 sq. ft. Always wear eye, skin and respiratory protection when applying this product.Use in a well ventilated area away from open flame. Store in a cool dry place. (Q) Can this be used on the outside of frame without painting? (Q) Can Eastwood Internal Frame Coating be used on an oil pan will it with stand the heat? 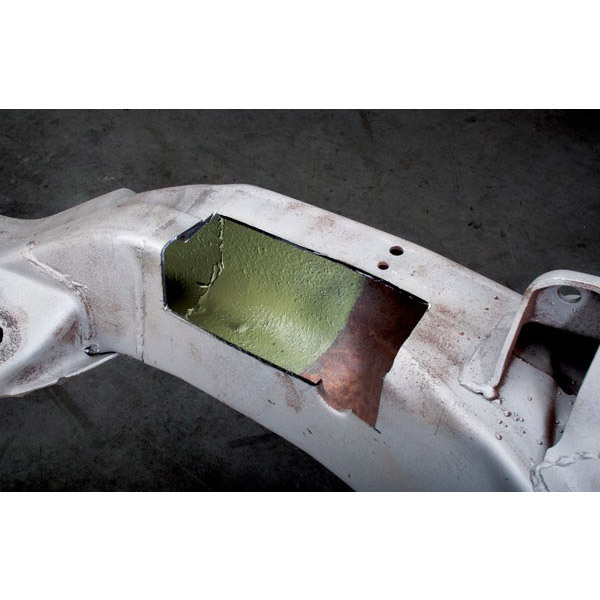 (A) If you are spraying the outside of an oil pan to stop rust you should use our Rust Encapsulator instead. This product is heat resistant up to 400F. (Q) Does a frame section have to be completely free of oil and grease? The frame on my vehicle was internally sprayed with oil a year or two ago. 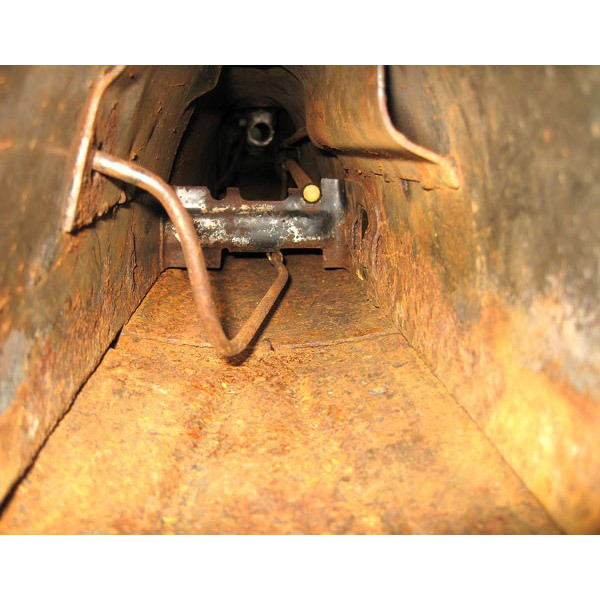 Oil is not dripping out, but drain holes and seams have oil residue around them, so some oil is present. (A) Oil is typically going to cause an issue. The frame should be as clean as possible inside and out before the application of any paint materials. (Q) What temps can this product handle? If it is already applied and I plan on having the outside of the frame powdercoated, can it handle the heat of the oven used to cure the powder coating? (A) Yes, internal frame coating is paintable. (Q) Is the product affected by diesel fuel and the treatment and conditioners available? I would like to use this product to coat a replacement filler tube to prevent rusting which happened to the oem tube. (A) It will not withstand any constant, repetitive exposure to fuel of any kind. 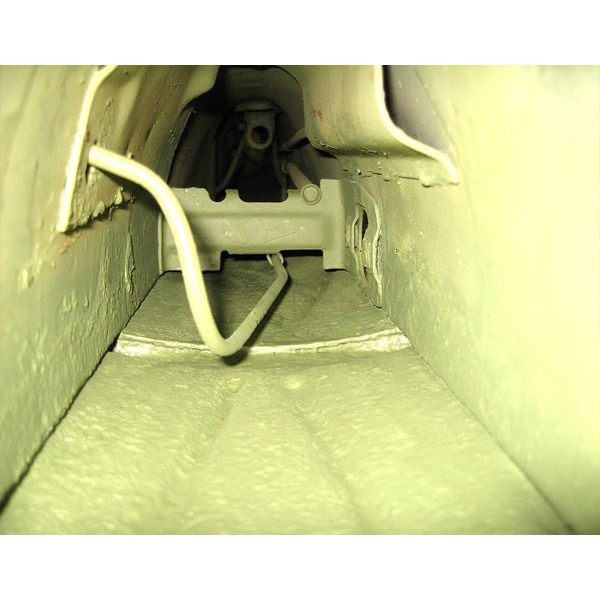 (Q) Can I use the frame coater inside the heater channels on a Volkswagen beetle and not have to worry about any ill effects from the heated air running through it? Temperatures would be a little over 100 degree f.
(A) Yes, if its only going to reach 100degrees max the product will hold up just fine. (Q) at what temps can it be applied? (A) Internal frame coating and all other liquid paint materials should ideally be applied between 70 and 90 degrees. To protect this trucks chassis from future rust, we show how to apply Eastwood's Internal Frame Coating to the inside of the frame. I bought this product for my 99 Wranglers frame rails, rockers, and hidden tub area. The secret to this is like painting, prep and more prep and then some more. Every evening I would blowout the frame rails, spent five nights. In both rails I drilled a 1" OD hole for debris to fall out. I made a 5' long hose from poly-flow tubing and ran my compressor up to 100 psi, inserted the hose and opened the valve while feeding the hose through the frame. It flops around inside the rail and blows out a lot of stuff. Go for a drive and do it again. You will be amazed at the debris you loosen up. Do the same thing to the rockers. Most of these jeep rust at the seams so with the flexible tube I was able to go behind the tub and coat that seam after cleaning it out. I will use this product again. Oh and I used 4 cans for the rails, rockers and up around the tub. I suggest a hot sunny day so it flows and I did it in the grass. Uncoil the tube and restrained it laying straight in the sun for 30 minutes, take out the coiling memory. Eastwood Internal Frame Coating does a great job that lasts. Many complaints are related to the hose extension coiling up. To solve this problem use a piece of mig wire the length of the tube and insert it in the extension tube, you can now form the tube to get where you want to spray. Works great soak the hose in lacquer thinner and you can use repeatly. I used both the green and black Internal Frame Coating for my 48 Chevy 1/2 ton pickup. I used the green product to treat some light surface rust up behind the dash that I could easily get to. I used the black product to go inside my frame cross member and inside pockets of the frame rails. Before I have engineered a throw away Dollar Store Feather duster dipped in POR-15 and ran it through the frame rail. The only draw back is it uses a lot of product and doesn't 100% guarantee full coverage. 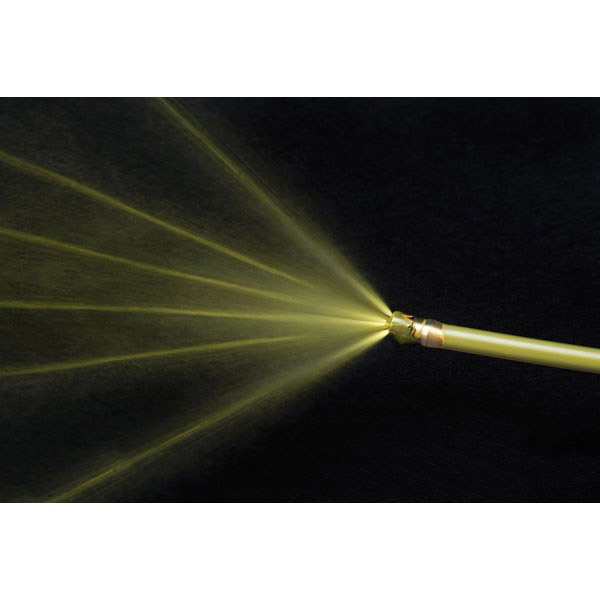 I really like the long 24" flexible tube with 360 degree spray coverage. I will use this for all future projects. I have used this product on all my older cars and it is a fantastic product. Also experimented with some external surfaces on a trailer and it holds up superbly on surfaces that I used to have to repaint every year. Coincidently I used the same technique described by another user to get the tube into long cavities by taping some thin welding wire to the tube. Be careful not to get on surfaces where you don't want it (including garage floor) and remember it will drip out of drain holes that could be far from where you apply it. It is nearly impossible to remove once it cures. bought 3 cans to spray a chassis for a 1976 bronco, follow eastwoods instructions and watch their demo on you tube. I taped up the ends of the chassis to keep product from spraying out the rear. you need to spray from the bottom up also to coat the top inside of the chassis for the best coverage. lay the hose out for a day in the sun it will straighten out. shipping thru fed ex is slow took a week and a half to get mine, I'm 1500 miles away. waiting on their chassis gloss black paint to finish the job. hope to post some pics of it when I get done.